Pink Ice is a gorgeous, rambling bush that is covered in masses of pink clusters of flowers arriving in Spring. Not only are people a huge fan of this beauty, with her pretty mint-green and pink foliage, but butterflies are also very attracted to the pink blooms. 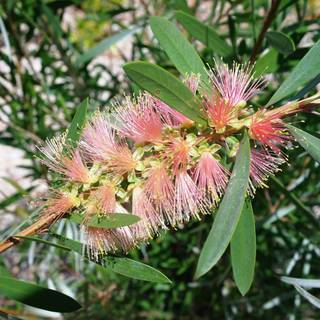 She grows to 2 metres, and is quite hardy, being both frost and wind tolerant. Semi-deciduous in cooler regions, she is excellent mixed in with other plants. Kept compact through regular pruning, this plant is ideal for rockeries, screening, borders, feature planting, and allowing to cascade over embankments. Frost & wind tolerant. Most well drained soils, mulch in summer. Full sun to partial shade.